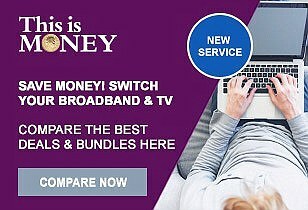 Slow broadband can knock up to 20 per cent off the value of your home and could even stop it selling, Money Mail can reveal today. Last week, we told how residents of a new-build development in Barnsley, South Yorkshire, endured internet speeds so slow it could take an afternoon to download a film. Estate agents routinely display estimated speeds alongside marketing information and property experts believe it is a buyer’s right to know if a home has a poor connection. One buyer, who discovered their new home had no broadband coverage at all, even took their complaint against an estate agent to the Property Ombudsman — and won. Telecoms watchdog Ofcom has warned that nearly 700,000 ‘forgotten homes’ across the UK do not have broadband fast enough to meet a typical family’s needs — it considers a ‘decent’ connection one with a download speed of at least 10 Mbps. Buyers who’ll need to work from home, such as families and young professionals, are more likely to be put off by low broadband speeds, estate agents say. And properties with poor broadband are more likely to take a hit in urban, rather than rural, areas. But savvy buyers do. ‘Poor broadband can be the difference between buying or renting a property and not,’ says Jeremy Leaf, a North London estate agent and former residential chairman of the Royal Institution of Chartered Surveyors. ‘Particularly for young people dependent on the internet, it’s fundamental and it can make a huge difference. Experts believe buyers should be informed when properties have poor or non-existent broadband. 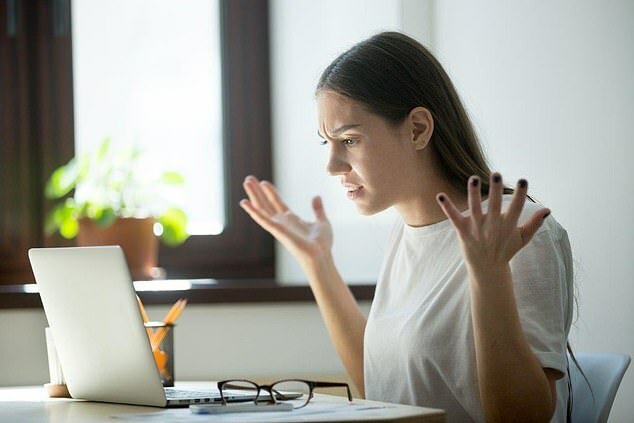 In the case of the buyer who discovered their new home had no broadband, the Ombudsman found in their favour after ruling the developer knew internet was an issue and the agent failed to ask questions of the connection. 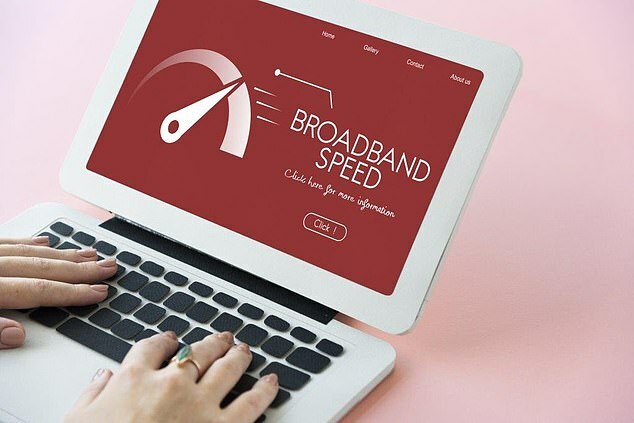 There are no legal requirements for estate agents to disclose broadband speeds, but property sites such as Zoopla often display this information if they have it. Money Mail reader Gareth Griffith, 64, fears he had to knock £10,000 off the asking price of his home after a mistake was made over his internet speed. He and his wife Janet, 62, put their four-bed detached home in Blyth, Nottinghamshire, on the market for £289,000 in April. But after they failed to draw in enough viewers, their estate agent advised them to lower it to £279,000 in May. Gareth says he noticed in October that his home was listed on Zoopla with a broadband speed of just 7.1 Mbps, when he thought it was closer to 42 Mbps. ‘Nobody in their right mind would buy a house if it didn’t have decent broadband,’ he says. Money Mail reader Roger Searle might have one of the worst broadband connections in the country. As a tour and production manager, his job involves managing the logistics of sell-out gigs and working for stars such as Sir Cliff Richard. But with broadband download speeds as slow as 0.3 Mbps — the minimum standard is considered to be 10 Mbps — his internet rarely keeps up. 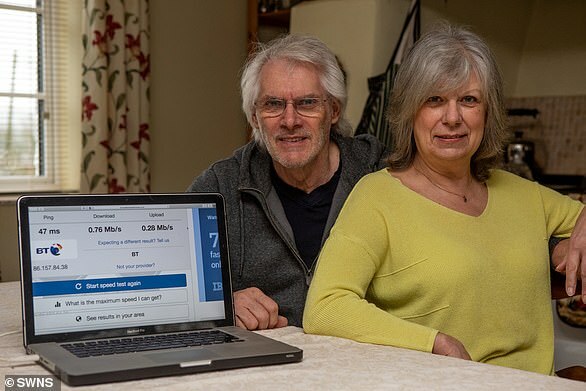 Roger, 70, is just one of many readers who got in touch with us to tell their internet connection horror stories after reading our report on how some developers are failing to provide new-builds with the latest fibre optic technology. Roger lives with his wife, Sheila, 69, in picturesque Huish Champflower, Somerset, at the ‘very edge’ of the Brompton Regis telephone exchange. But despite ‘many conversations with BT engineers’, the couple say the 15 or so houses there are not deemed ‘economically viable’ when it comes to installing broadband technology. ‘For work I have to download PDF packs full of information about venues, and if there are photos I have to take it to my daughter’s house,’ says Roger. Daughter Arlene-Marie lives just 15 minutes away but enjoys an average speed of 18 Mbps. Roger pays BT around £28 per month for broadband, but on some occasions has been left with no connection at all. When a phone pole came down in a storm, Roger had to seek a mobile signal at a local pub and use his phone as a hotspot while he worked on his laptop in the car park. The impact his poor broadband could have on the value of his property is something which has crossed his mind. ‘At some point, the house will change hands and 20 per cent is quite a large chunk of a property’s value,’ he says. A spokesman for Openreach, the network arm of BT, says: ‘While more than 96 pc of UK homeowners can order a superfast broadband service, Mr Searle is one of the last few who can’t. We’ve been working on 800 Community Fibre Partnership schemes and so far we’ve upgraded more than 66,000 homes and businesses.